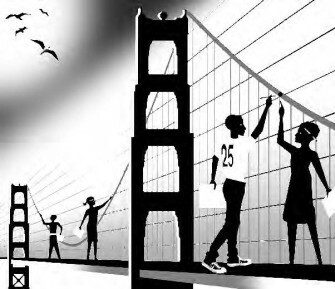 Media depictions of San Francisco show idyllic images of fog pouring under the Golden Gate Bridge or happy tourists riding cable cars, but rarely the mostly nonwhite neighborhoods of the east side. San Francisco public schools have a bad track record of mimicking this masquerade, with very low numbers of African American and Latina/o students making it to senior year, and less than a quarter of those who do, graduating with the credits to move on to college. Our high school, the June Jordan School for Equity (JJSE), is located on the east side of the city, and was started by a group of teachers and parents who were disturbed by the high numbers of black and brown youth being underserved and then dropping out. Our commitment to send students of color to college means that they need a strong math education. No one took making explicit social justice connections more seriously than Adam Renner, who started as a 9th-grade math teacher at JJSE in fall 2010 after many years as a teacher educator at the university level. In one of his first major projects, he had his students use math skills as a way to dig into a deeper understanding of the chasmic divide between rich and poor in our city. He wanted to shed light on the impact of economics and the structures of racism on education, housing, and job opportunities. 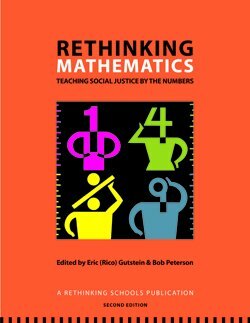 For other articles on the link between math and social justice, see Rethinking Mathematics: Teaching Social Justice by the Numbers. Book – Non-fiction. 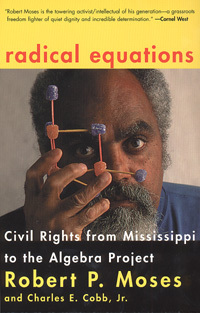 By Robert P. Moses and Charles E. Cobb Jr. 2001. Interactive lessons on economics and equity.